For every day that passes, I see more and more analogies between the Internet’s early years and today’s status with the blockchain’s evolution. In 1994, when the web came along, websites were the novelty, and up until about 1998, we kept lists of Fortune 500 companies with or without websites. It took about three years before most companies were on-board. Then, many of these early sites were criticized for being just glorified brochures or information sheets, and we looked to Amazon as one of the few companies that actually conducted business on the Internet. Fast forward to 2015. The blockchain is the new website. Yes, blockchains are geeky, (and the challenge is to take out that geekiness), but fairly soon, every company will have a blockchain, or be on a blockchain, or several ones, just as organizations are involved in many websites today. Why is the blockchain like a website, and what’s the novelty that blockchains bring to companies, individuals, society and governance? If the website was the starting point, let’s remember the key mini-revolutions that the Internet brought us since 1994: Personal Communications, Self-Publishing, E-Commerce and the Social Web. In hindsight, each of these four phases was defined by the functions they disrupted: the post-office, print media, supply chains/physical stores, and the real world. 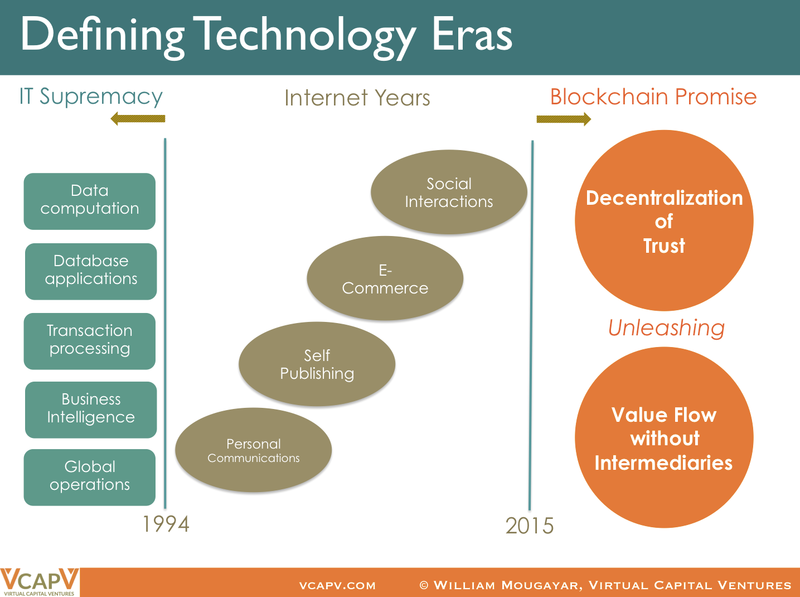 From 2015 onward, we will enter the Blockchain Promise phase, demarcated by the key theme of Decentralization of Trust, unleashing the advent of value flow without intermediaries. The blockchain is therefore a capability for Exchanging Assets Without Central Intermediaries. With the decentralization of trust, we will be able to exchange anything we own, and challenging existing trusted authorities and custodians that typically held the keys to accessing our assets, or verifying their authenticity. We can think of Bitcoin as the training ground for what blockchains can enable, because Bitcoin is the most widely used blockchain application, containing all the required elements of a new economic ecosystem with committed participants and a good degree of technological, business process, societal and governance innovation. Bitcoin, the cryptocurrency, is the quintessential digital asset class that moves efficiently and transparently across a global blockchain that knows no boundaries. Think about other asset classes that you are familiar with that can mimic Bitcoin’s capabilities, and you can start to imagine some of the possibilities. Therefore, if you haven’t used Bitcoin first-hand, you may not get the inherent advantage of a quicker appreciation and understanding of its potential. Seeing assets move swiftly without intermediaries is an eye opening experience, and that is just a starting point. It’s like surfing the web for the first time, which suddenly gives ideas about the possibilities ahead. The fundamental innovation with the blockchain is that the ownership of the asset is with the owner of the asset, not with a (central) party who owns a database that points to a record that says who is the owner. The current status of accounts and ledgers for money or other assets are really mirrors of some (central) database that determines who owns what. When you initiate a transaction from your own accord, the database reacts by conducting checks and balances, and then makes an update that reflects the changes after the finality of a settlement takes place. If the central authority wanted to lock out user/ownership access, they can. Instead of requiring each central intermediary to maintain their own database, and burdening them with reconciling it with another recipient database, the blockchain is a record that is shared by multiple parties who have a stake in it, and agree to participate by updating a single version of the database (ledger), each adding their own part of the pie. But this read/write aspect is not the only difference. There is added granularity around access rights by whom, of what, when, and under what conditions, yielding an entire spectrum of programmability and optionality. Imagine if any real world asset could be mirrored on the blockchain either directly (via transfer or creation), or indirectly (via anchoring), it would create a large inventory of tradeable blockchain assets, and a resulting groundswell of economic activity. Your product is launched. Now what?